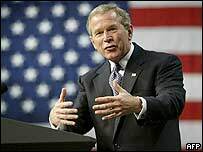 In a major foreign policy speech in Washington, US President George W Bush has challenged the countries of the Middle East to adopt democracy. By advocating the spread of democracy to the Muslim Middle East, President Bush is embracing one of the big ideas of the "neo-conservatives" - the radical Republicans whose influence has grown so markedly since he entered the White House. For the neo-conservatives, the end of the Cold War should have marked the opening of the floodgates of democracy all over the world. But some areas, the Middle East notable among them, remained stubbornly resistant to the trend. The neo-conservatives believe successive American presidents, essentially because of their need for oil, allowed the region's rulers to stick to their old authoritarian ways. The folly of this, they argue, was dramatically exposed by the attacks of 11 September 2001. And, crucially, those attacks gave the neo-conservatives a unique opportunity to put things right, as they see them. In his speech in Washington, President Bush was blunt in castigating what he (and the neo-conservatives) regard as the mistakes of the past. "Sixty years of Western nations excusing and accommodating the lack of freedom in the Middle East did nothing to make us safe, because in the long run stability cannot be purchased at the expense of liberty," he declared. If Mr Bush is as good as his word, it will mark a radical departure from the traditional realpolitik of American foreign policy. But will he follow through? Already commentators around the world are pointing to the most obvious difficulties. How to convince Middle Easterners you are serious about human rights and democracy when, in Arab and Muslim eyes, a whole people - the Palestinians - are being denied their rights? How to be consistent and avoid the inevitable charge of double standards? Will Washington be indulgent, say, to the military-backed government in Algeria - whose human-rights abuses are well documented - because that government can be useful in the "war on terror"? Will the US put equal pressure on allies and enemies? Though Mr Bush said two allies, Egypt and Saudi Arabia, had to do more, will he end up treating them with kid gloves, while reserving the bludgeon for Iran and Syria? If elections brought to power anti-US governments, would the US administration change its mind? There is much scepticism about whether Mr Bush's goal is achievable and whether the administration, or for that matter the American people, have the staying power necessary for success. But at the same time what is clear to anyone who visits the Middle East is that there is a huge pent-up demand for greater freedom. For all their mistrust of the United States, many in the region will be hoping that, if there is sustained American pressure, their rulers will at last get serious about reform.